The Kunio-kun beat 'em up franchise, called the River City series outside its native country, is best known for its comedic depiction of teenage gang violence with the help of super deformed sprites; it's impossible to take any of this serious when characters make ridiculous expressions while being smacked with trash cans or scream "BARF!!" on a second by second basis. However, the IP does another thing well: reuse the same setting for the last 30-plus years. You constantly have teenagers fighting in the streets, school hallways, and construction sites within Japan, and it's not wrong to think things seem uninspiring after nearly four decades. Wisely, the company decided to stray from the typical formula with the release of Knights of Justice, which puts the series' characters into a fantasy-based setting, Riverandia, with knights, wizards, princesses, and goblins aplenty. Thankfully, it's not purely a visual change of pace, as Knights of Justice takes River City's tried and... tried... template, one where players pummel baddies, grind for coins, and use them to purchase health items, weapons, and special attacks, and blend these mechanics with traditional JRPG elements; a weird thing to say, considering the beat 'em up franchise is already heavily influenced by "RPG" features. One such addition to the River City design here is the inclusion of an overhead, Mode 7-inspired map, and it's the only means of traveling between towns and key locations. It's not free roam, either, as you have to pick a spot, watch the protagonist auto-travel, and hope he arrives without being badly hurt from an altercation. 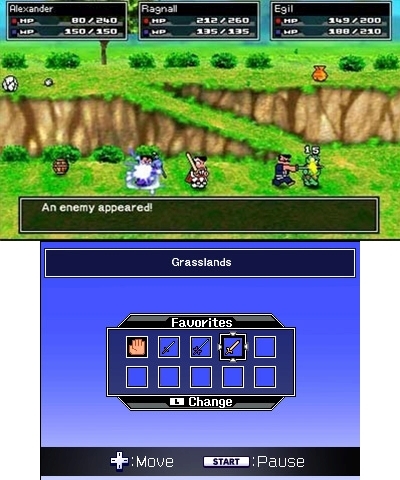 In a twist that shouldn't surprise any JRPG player, the game has random encounter battles during travel. Amidst combat, it plays like a typical River City brawler, going so far as to include that weird blocking maneuver that fails more than it works. However, taking further steps to distance itself from the usual fisticuffs title in the series, there's a heavy emphasis on weapon combat. No longer are they just random, optional objects strewn throughout the play area, you get to purchase, keep, and even steal weapons of varying, unique strengths. Along with mundane swords with normal strength increases, there's one that potentially revives immediately on death, as well as numerous magic staffs that can raise the dead for assistance or summon flame projectiles if you prefer a safe range. The devs were also very generous with how many weapons and items are allowed in combat, since there's a total of nine slots to switch between, permitting a diverse play style if wanted. Another notable inclusion is the abundance of side quests. Just how many? Nearly every NPC you talk with activates a quest. There's soooo many side quests, from fetching specific items to just pummeling gangs of knights, amoebas, or slime creatures, that undertaking optional missions can take up several hours just to kill time. Shoot, at one point in the game, I had nearly 15 to-do quests listed. You'll get some hefty reward money from completing most, so they're good for attaining absurdly expensive weapons, such as the god gloves or, of all things, a shuriken. Because you reeeeaaalllly want that shuriken, right? With such attempts to have the River City template take place in an entirely different setting, and doing so while adding new aspects to separate it from the norm, Knights of Justice felt like it could have been one of the better titles in the series. I genuinely thought all this as I played to completion. Then... I decided to perform an experiment for curiosity's sake: play the game a second time, but without doing any side quests. I was so engulfed with how many side quests I could complete before getting bored, that I didn't take the time to experience how the main adventure feels without the extra stuff. See how hard it actually is. I reached the final boss within 80 minutes. Knights of Justice went from feeling like one of the most fleshed out titles to grace the IP, to one of the most transparent, simplest games in the series. I didn't even have to grind to get the strong stuff; I always had enough money from dead foes during main quest battles and a huge sum given by a king, that buying stronger stuff and plenty of health items was never an issue. So why do side quests even exist? If they were more than just "go here, beat someone up, or grab an item," then sure, diversity. But it's obvious these are here to grind for money, which can then be used to buy powerful stuff... but, again, that's already possible by following the main quests. Knights of Justice doesn't even have the excuse to grind in order to complete harder side quests, because there isn't such a thing. They're basically here to give the illusion of a big game with variety. Playing through the second time, I also noticed the overall poor design of the game. The overpowered, rapid kick special move that's in nearly every River City brawler is "replaced" by an overpowered, rapid sword attack, since you'll be using weapons more here. However, given that I easily plowed through my second playthrough without ever touching a special attack, its existence, along with all other special moves, is absolutely trivial. An illusion of options. Shoot, you can't even stat-build your protagonist, a staple in other RC titles! With that said, the enemy AI seems rather brainless compared to other RC titles; they occasionally sneak in a charge or throw attack, but just keep mashing the hit button, stand back when they get up from the ground, and you'll be fine! Your optional AI traitors allies are worse, because they have this insane habit of standing behind your protagonist as he's getting his face clobbered. An illusion of power. This entire product should have worked, even if on an average level of quality after some tinkering. 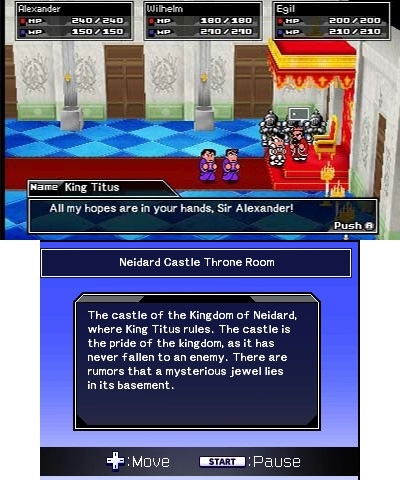 Sadly, Knights of Justice crashes and burns because it failed to use its JRPG concepts properly, not to mention dumb down its own RC formula; makes the whole thing feel like a marketing ploy to draw newcomers into the franchise. I honestly believe the devs thought they could distract players enough with the excess of side quests to not notice how shallow everything actually is. That would greatly explain why almost every NPC has a side quest for no real reason... Almost worked, too. If you enjoyed this River City: Knights of Justice review, you're encouraged to discuss it with the author and with other members of the site's community. If you don't already have an HonestGamers account, you can sign up for one in a snap. Thank you for reading! None of the material contained within this site may be reproduced in any conceivable fashion without permission from the author(s) of said material. This site is not sponsored or endorsed by Nintendo, Sega, Sony, Microsoft, or any other such party. River City: Knights of Justice is a registered trademark of its copyright holder. This site makes no claim to River City: Knights of Justice, its characters, screenshots, artwork, music, or any intellectual property contained within. Opinions expressed on this site do not necessarily represent the opinion of site staff or sponsors. Staff and freelance reviews are typically written based on time spent with a retail review copy or review key for the game that is provided by its publisher.